End Your Algae Problems Forever! Your Pond Algae Questions and More...Are Answered! Let's be honest. The chances are pretty good that if you're here, on this website, and reading about this program…you've got an algae problem in your pond. It happens to most of us pond owner's at one time or another, so if it helps to ease the pain at all, just know that you're not alone. Many people have struggled with it. Whether it's thick and dense string type algae, gooey green water, or floating mats or surface scum, algae just isn't an appealing thing to have around. At the very least, it's often ugly to look at, and at worst, it can cause major disruptions in your pond while putting your fish at risk. Now don't get me wrong. A little bit of algae isn't really a bad thing, and it actually might be a sign of some healthy things going on in the pond. But when it takes over everything, it can create a lot of problems, including a very frustrated pond owner. But here's some good news. There is a solution to your pond algae problem. I guarantee you that with the right approach it can be cleared up, and no, I'm not necessarily talking about even using a chemical to do it. I've spent the last 10 years helping countless pond owners with all kinds of problems, but the number one question I get is how do I control pond algae in my pond? Folks want safe solutions. Easy remedies. And straightforward talk about what it will take to create the pond they've always wanted. 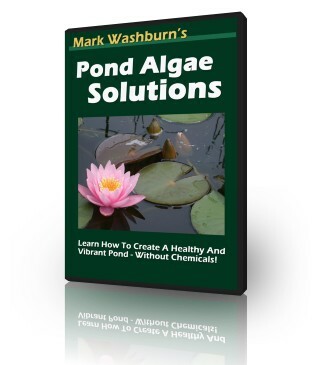 And after so many years of helping people, one on one, with their algae issues, I decided to take everything I've learned, and taught, and put it into a single volume of work that could help even more people with their ponds. In the Pond Algae Solutions program you'll learn more than just the basics of pond care and algae control. And I have to tell you...if your tired of trying everything in the book, or wondering just what it's going to take to get your pond where you want it to be...you really need to consider investing in this program. It very well may save you hundreds, if not thousands of dollars in products or methods that won't work...not to mention a heck of a lot of time and trouble. It probably sounds like such a bold promise but I know from experience that the information in this program will help you do all of that and more. Plus I don't just talk about pond algae. As you know, there are countless problems that a pond owner will have to deal with at one time or another. You know, the little things that just seem to crop up unexpectedly and sometimes without warning. - The many forms of pond algae and how to treat each one. - Is algae good or bad to have in your pond? You might be suprised. - What are the root causes of algae and why is it taking over your pond? - What solutions exist to combat algae in your pond? We cover nearly all of them and discuss the pros and cons of each option! - How to save money on mechanical devices like filters...not all of them will help your pond algae problems. We discuss what works. - When and where chemical treatments may be your best bet. - How using any algaecide can be deadly if it's applied incorrectly. This advice could save your fish! - Why aeration can keep a pond free of algae and create a healthy pond. - Plus we discuss how to control duckweed, cattails and other aquatic weeds. For local customers that contact me I usually charge $75 per hour for a private consultation. I'd like to think that they feel it's been money well spent, particularly if they gain a clearer understanding of their pond or water garden. In this program I cover over three hours of solid information on a wide variety of topics, with a heavy emphasis on pond algae. Yes, my focus in this program is pond algae...mainly because it affects so many people and I get ton's of questions on it. But I also think it's important to share insights on other things that might be on your mind as a pond owner. So, several months ago we ran a survey and asked pond owners just like you, what your single biggest pond questions might be. And we received hundreds of replies! After reviewing all the responses we selected a number of them that were very common questions for a lot of folks. And I wanted to provide answers to some of these questions in this program. That's why I've included a special bonus Question and Answer session that covers things such as how to keep predators from harming your fish, tips on caring for your aquatic plants and which one's work best for certain issues, and how to deal with problems such as ammonia spikes and pH problems in your water chemistry...plus much more. Having been a pond owner myself for many years, I know what kind of investment it can take to get one up and running well, and then to maintain it day after day. We put a lot of sweat, and sometimes tears, into the thing, and don't even get me started on the dollars and cents. Things can really start to add up. For people fighting an algae problem, it's not uncommon to just keep throwing all kinds of treatments into the water, hoping one will help. How does the old saying go? Sometimes you win, sometimes you lose…but it all costs something. So I'd suggest you stop tinkering around and quit throwing good money after bad., Instead, invest a little bit of it into your own education. It's money well spent and the payoff will come through a lifetime of owning a pond. Take some time and learn the secrets that successful pond owners know about controlling algae in a pond and you will never, ever regret the investment! Get the ALL NEW Pond Algae Solutions program today for only $39.95 $19.95. After payment you'll have instant, lifetime, access to the current program and all future updates that I make to it. So if your interested in really getting to the heart of how to keep your pond free from algae problems AND save some bucks to boot...I'd urge you to order this program today. I think you'll really enjoy it and find it very educational on pond algae and other related problems. Even though I've consulted with hundreds (or maybe thousands) of satisfied customers over the years...I've always felt very strongly about putting my money where my mouth is. I want my customers to get good results and I dearly want them to have the pond they've always dreamed of. It feels good to help folks achieve something like that! In the end though, the judge of how good my information is...is you. And I want you to be totally satisfied with this program. I want it to help you and your pond. So here's the deal. Order Pond Algae Solutions today and watch the program. Apply some of the things I talk about and judge for yourself. Take all the time you need....up to 3 months...and if you don't think you've gained insights into your pond that you didn't know before, or the information didn't help you improve your pond..or your just not happy for any reason at all...just email me and request a full, no-hassle refund. It's as simple as that. To order just click on the link below and remember...you have three months to listen to the program and apply what I talk about and I guarantee you'll see improved results in your pond. How do I know? I know because it's the same, fundamentally grounded, time-tested information I've been sharing for years with my customers. Only $19.95 For Instant Access!